Caricature artists for hire. Columbus Ohio. 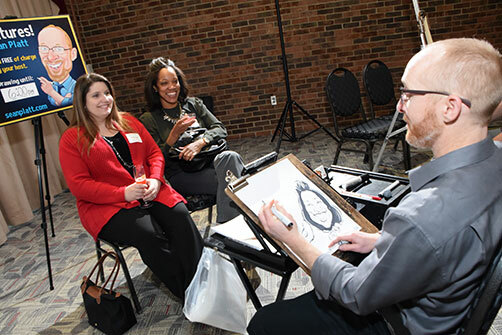 Caricaturist. Entertainment for Events and Parties. Welcome! Starting May 2018, Caricatures! by Sean Platt will be back to operating in Ohio after 3 years in California! So if you need a caricature artist with 23 years of experience to draw for your party or event in Dublin, Bexley, Westerville, Pickerington, New Albany, or any other area in and around Columbus or Central Ohio, give Sean a holler! Sean has drawn for many events over the past 23 years. And with that comes a wealth of knowledge. When you hire Sean, expect an artist with a professional sketch who is fun to watch, courteous, mindful of the client's wishes, and respectful of the audience (drawings that are tasteful). set- up very seriously. From professional signage, to efforts made to make the set-up as sleek and minimal as possible, his presentation will be complimentary to your event. Great communication before, during, and after the event is a high priority for Sean. He desires that all who hire him are greatly satisfied with the entire experience and not just the caricatures.